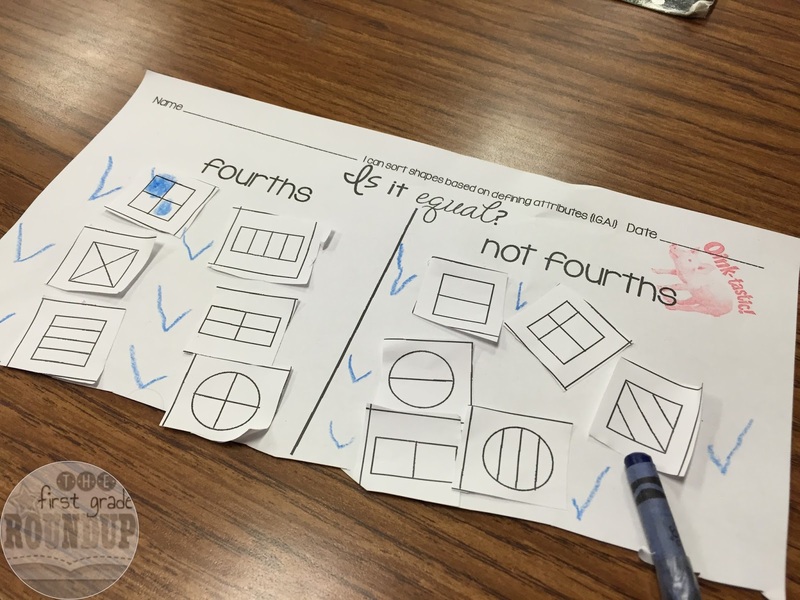 We've been tackling ~FRACTIONS~ the last two weeks in first grade! I used to dread teaching fractions to 6 year old littles, but thanks to some extra CGI training on fractions...I love it! The biggest ah-ha I've learned over the years is that fractions and shapes go together. They are all under the umbrella of "geometry." Having math talks about shapes bleeds over into conversations about fractions and vice versa! 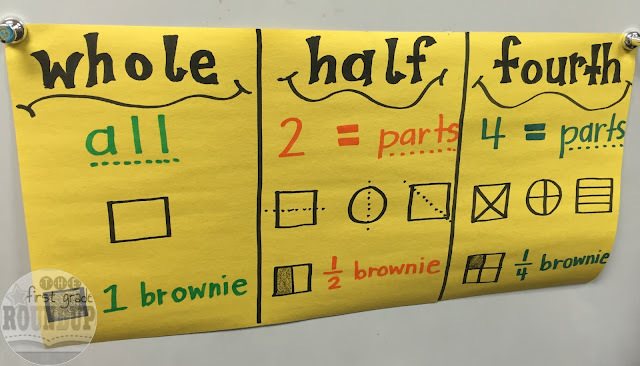 We spent the first week talking about the difference between "whole" and "half." "Mrs. Shaddock has 1 cookie to give to 2 first graders. How much cookie can each friend have to get a fair share?" We shared many of these and talked about the fact that if I just say "1" or "1 piece" I don't know how much that is. When I just say "1" I'm assuming a whole cookie...If I told you I would give you one cookie, but I only gave you one small piece, you would be upset because you assumed I would give you the WHOLE cookie! Of course, we didn't add the fourths until the second week. Also, notice the emphasis on this anchor chart on "whole" and "part." We worked on fraction CGI problems these weeks, but also some part part whole CGI problems and we were able to make some really great connections between these problems and fractions during our share time that made fractions easier to understand! *Share the paper between your table group and choose a "pen" (or pencil or crayon) to share between your table group. *One person starts and divides a shape in half/fourth. *Then, they....wait for it...pass the pen...to the next person at the table who has to divide another shape in half/fourths a different or new way. *They keep passing the pen until they cannot think of any more new ways. It's definitely not rocket science, but they love it! And this game is so good to use in pretty much any subject area! We did one round of the squares and then shared pictures and talked about if they were halves/fourths and why or why not. We talked a lot about being precise and how that affects the partitioning. And for whatever reason, squiggly lines were quite popular this year, so we had to talk about that too! 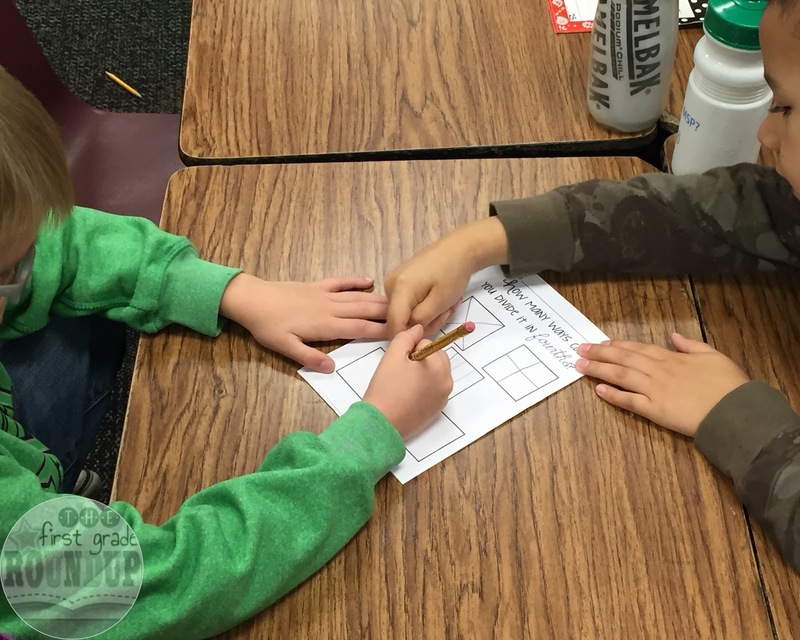 Once we discussed the squares they flipped their paper to the other side and played the same game with circles. 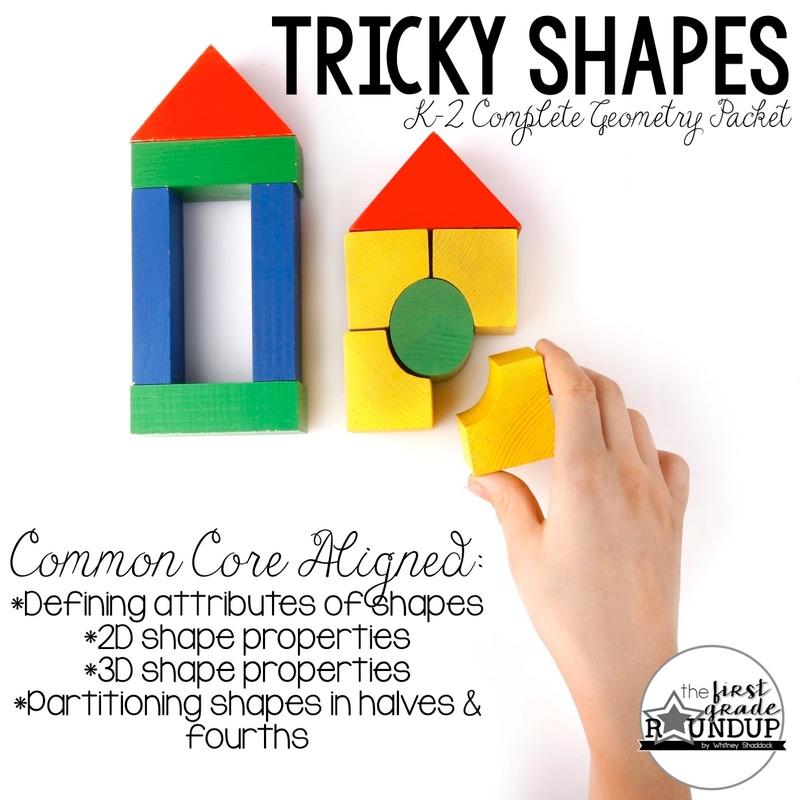 Grab these activities and more in my complete geometry packet! Do you have your fraction CGI problems availabe? I bought your tricky shapes pack and am trying to figure out what else to use to make it work. I have no math curriculum so I just come up with my own, or use wonderful teacher's ideas such as yours. Yes! They are in my math mysteries packet if you've already purchased that file from my store. 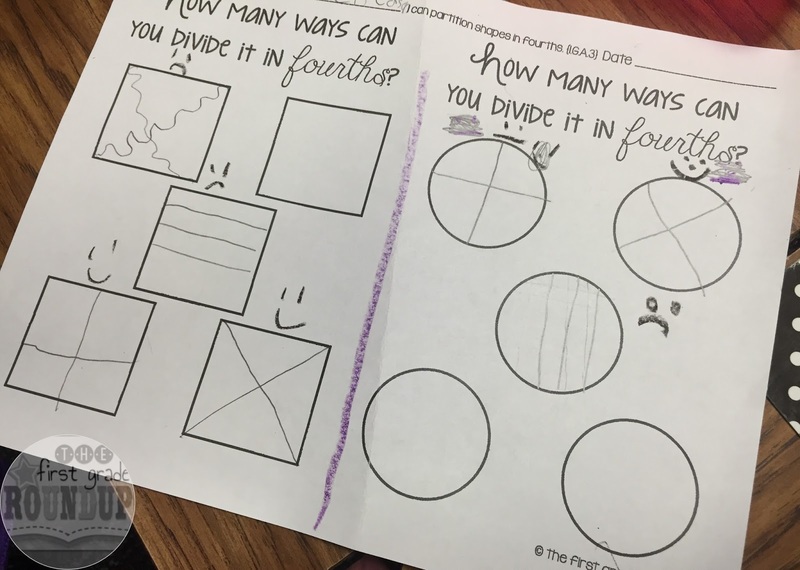 If you look for the Partitive Division Problems (they say PDIV in the bottom left corner of the page in the file), you can use number sets to do fraction word problems. Like Angela shared 1 cookie with 2 friends. How many does each friend get? Hope that helps!! Just one more quick question. When do you fit your math skills into your daily math schedule? Math Skills and Math Wall are all the same block of time. In general, I have stopped doing math wall every day. This year, I do full math wall once or twice a week and focus on Number Talks or other math skills like fractions the other days. I added a pacing guide to my store that goes more into detail about how I schedule everything out and what math skills I teach, when I teach them and what week-by-week goals look like for the entire first grade year. Hope that helps! Thank you!!!! I will be purchasing that also! I do have those. Thank you! I should have known that. It's been a long day!